The zebra is an apparently tranquil animal, but of a wild and unpredictable nature that lives in a herd. Thanks to its mantle, it is associated with the duality of light and shadow, free spirit and common sense. Precisely for this reason there are different symbolic meanings. 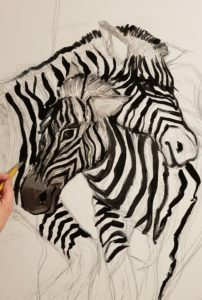 According to some, the zebra teaches to find the right balance to be realized in all aspects of life, it evades danger and this is the key to its survival. The force of freedom, the power of deception towards enemies. It also represents the discovery is the observation of self. More squat of the horse but rich in meaning. 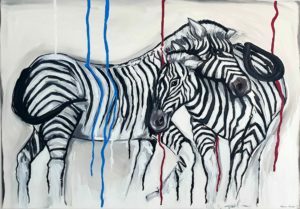 The painting Zebres is a contemporary work, made of acrylic on canvas 100X70, where two examples are hand painted in affectionate attitude, almost a hug that deceives the view, making it seem that they blend into each other dissolving into the canvas. Their coat is crossed by color that flows through the canvas from top to bottom, to awaken the gaze and to represent the colors of energy.